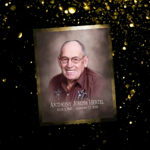 Anthony “Tony” J. Hertel, 83, of Cole Camp, MO, passed away Sunday, January 13, 2019 at his home. He was born on June 2, 1935 in Grayslake, IL, the son of Anthony G. and Florence (Etten) Hertel, who preceded him in death. On April 7, 1956 he was united in marriage to Carol Jean Moore, who passed away on February 22, 1991, she was buried in Highlandville Cemetery in Highlandville, MO. On December 28, 1991 in Sedalia, MO, he was united in marriage to Cecilia Ann Ravenscraft Wood, who survives of the home. Tony was a member of the First United Methodist Church Celebration Center, Sedalia. He managed farms for twenty years, operated heavy equipment at Howard Quarries for thirty-five years, and did pick up and delivery for John Deere for two years. He loved his family and was a great husband and father. He will be dearly missed by all who knew him. Besides his wife Cecilia, survivors include his daughter Valerie Snider of Ridgeway, MO; son Randy Hertel of Highland, NJ; step-sons Billy and Bruce Wood of Sedalia; two brothers, Albert Hertel (Kay) of Grayslake, IL, Alfred Hertel (Carol) of Cole Camp; two sisters, Teresa Johnson of Granview, IL, Florence Clark (Bob) of Lewisville, NC; ten grandchildren; two step-grandchildren; and nineteen great-grandchildren. Besides his parents and first wife Carol, he was preceded in death by a daughter, Vickie Brandkamp; a brother, Leo Hertel; and a sister, Mary Lang. Funeral services will be held at 10:00 a.m. Thursday, January 17, 2019 at First United Methodist Church Celebration Center, Sedalia, MO with Rev. Jim Downing, Jr. officiating. Visitation will be from 6:00 p.m. until 7:00 p.m. Wednesday, January 16, 2019 at Rea Funeral Chapel, Sedalia. Burial will be at Memorial Park Cemetery, Sedalia, MO. Pallbearers will be Mike Hertel, Joseph Brandkamp, Ricky Brandkamp, Justin Brandkamp, Logan Hertel, Scott Snider, and Doug Snider. Honorary bearers will be Michael J. Hertel, Bruce Wood, Billy Wood, Skyler Hertel, Randy Hertel, and Jesse Hertel. In lieu of flowers, the family suggests memorial contributions be made to the family in care of Rea Funeral Chapel. So very sorry for your loss. Prayers to the family. So sorry for the loss of your husband Celie. Sending prayers for you and the family. I’m only a text or phone call away if you need an ear or shoulder. Tony was an Amazing Step Dad. He really showed love to me and my brother. He helped me with so many projects like working on my car or my home. He always had a story to share. He loved to share how he once put gas in Al capones gas tank as a young boy. I really loved him and cherished him. He was a really amazing Fathet figure.